In previous articles I’ve discussed the three levels of police interactions: 1) mere encounter, 2) investigative intentions, and 3) custodial interrogations. Custodial interrogations are the highest form of police interaction and therefore provide a person with the highest level of constitutional protections under the US and Pennsylvania Constitution. The purpose of Miranda Warnings are to provide someone with their rights to remain silent in a situation where the criminal suspect has a reasonable belief that he/she is not free to leave during police questioning. 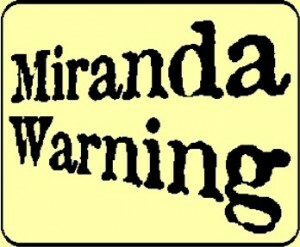 The Miranda warnings come from the United States Supreme Court of Miranda v. Arizona. This decision, clarified a person’s constitutional rights under the 5th and 6th amendments. After this decision, all law enforcement at the federal and state level were required to advise a criminal suspect of their rights to counsel (6th Amendment), their right to remain silent (5th Amendment). While the word custodial implies a clear indication of being in police custody (i.e. handcuffs, in a police car), it’s not that simple. Courts can find a custodial interrogation where a person reasonably believes that he/she cannot walk away from police and that that attention is unlimited in nature. See 18Pa.C.S.A.§2504. In the federal criminal justice system, Miranda Warnings are not required unless the defense can show “some indicia of custody”. Federal courts do not focus on “psychological and functional custody” but rather look at whether the encounter is a “police dominated atmosphere” where the suspect believes that the police will not release him until he makes a statement. In Pennsylvania, however, “custodial interrogation” don’t require that the police make a formal arrest or even intend to make an arrest but rather whether the suspect reasonably believes “his freedom is action is being restricted”. Considerations such as a person voluntarily appearing at a police station, being told you are free to leave at any time, or being told that you are not under arrest are all relevant to a court’s consideration in Pennsylvania. Pennsylvania provides much broader protections then the federal government with regards to a person’s right to counsel and self-incrimination under the fifth and sixth amendments.